In addition to Jacob and Evie’s own skill trees, you are allowed to improve your skills with Perks. However, this you must unlock with specific actions. How does it work and what Perks are in Assassin's Creed: Syndicate, we’ll show you in our guide below. New Perks you get by repeating certain actions in the game. 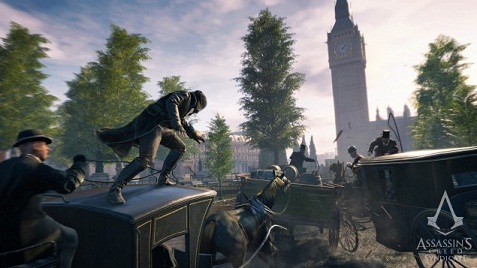 For example in order to unlock Assassination, which allows you to run faster you have to kill 120 opponents. In addition, you get experience points to your account every time. It is worthwhile to specifically unlock the Perks. In the chart below you can see all the Perks, including effects and activation conditions. Double Kill Your lethality increases by. 2 Perform a multi-execution with 2 opponents (40 times). Triple Kill Your lethality increases by. 2 Performs a multi-execution with 3 opponents (25 times). Quadra Kill Your lethality increases by. 2 Perform a multi-execution with 4 opponents (20 times). Combat Mastery Slightly increases the general damage done. Kill 4 enemies in under 12 seconds (25 times). Absolutely Stunning Increases the stun duration by 25%. Break the defense of an opponent (75 times). No Touchbacks Slightly increases the general damage done. Meet your opponent 20 times in the same conflict without being hit (25 times). Headshot Increases the damage of critical strikes. Perform the free target a headshot by (50 times). Ledge Kill Slightly increase the damage that its havoc with context-sensitive attacks. Kill an enemy with a context-sensitive projection-execution (25 times). Near Death Recovery Accelerate health regeneration. Survive a fight after you have reached a critical state. (50 times). Multi-Counter Kill Increase the damage you wreak when counter-attacking. Perform a multi-counterattack-Kill out (50 times). Counter Shot Increase the damage you wreak with a counter shot. Run counter-shots at 2 distance attacks in less than 10 seconds (25 times). Road Rage Increase the damage on opponents that are hit by your coach. Kill 3 enemies with your coach in under 25 seconds (25 times). London-Drift Improved control of the vehicle while driving. Drive to drift under the application of the brake by 10 curves (75 times). Gone Lawing Increase acceleration of police vehicles. Hijack a police carriage (50 times). Riding Shotgun Increase the damage you wreak when driving with firearms Kill off the roof of a moving carriage from an opponent with a firearm (50 times). Death by Rook Slightly increases the hit points of your allies. Let an opponent of a Rook kill (50 times). Wanton destruction Increase the damage you wreak when her rival car rams. Destroy 4 destructible things in under 15 seconds (75 times). Double Air Assassinate Decrease slightly the noise of your attacks. Perpetrate air double assassinations of opponents 2 (25 times). Cover Assassinate Decreases slightly the sounds that you do when you are moving. Eliminate an enemy from cover (75 times). Shoot the Messenger Lookouts take longer, until they discover you. Kill a Lookout before he activate the alarm (15 times). Assassination You can run precipitate faster. Committed an attack against an opponent (120 times). Electrifying Increase the damage of Voltaic bombs. Stunned 4 enemies with a single Voltaic bomb (50 times). Vanish in Smoke Smoke bombs for too long. Use a smoke bomb to a fight to finish and then disappear (25 times). Knife Hill Increase the damage you wreaks with throwing knives. Kill an enemy with a throwing knife from cover (75 times). Zipline Assassin Slightly decrease the noise of your attacks. Kill an opponent from a zip line (25 times). Vanish You will You will become anonymous quickly after a combat. Become anonymous after you have participated in a battle (25 times).